Greg Billing | For the Sidney Daily News Andre Gordon led Sidney with 22 points in the Yellow Jackets’ 72-68 victory over Northmont on Tuesday. Greg Billing | For the Sidney Daily News Sidney’s Ratez Roberts (2) goes up strong as Northmont’s Jordan Smith defends. Greg Billing | For the Sidney Daily News Sidney’s Josiah Hudgins (23) leads Sidney’s fastbreak as Northmont’s Isaiah Baldwins gives pursuit. Greg Billing | For the Sidney Daily News Sidney’s Lathan Jones (12) gave Sidney a 70-66 lead with 48 seconds left on his basket and ensuing free throw in the Yellow Jackets’ 72-68 win at Northmont on Tuesday. 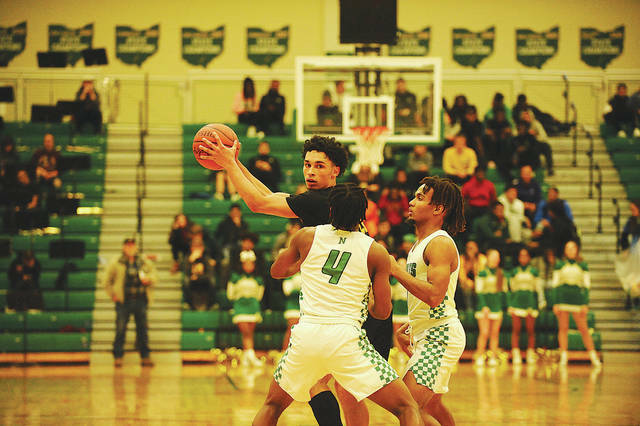 Greg Billing | For the Sidney Daily News Sidney’s Andre Gordon scored a game-high 22 points despite Northmont’s defensive focusing on the Virginia Tech recruit. CLAYTON – On Monday, the Sidney Yellow Jackets cracked the top 10 in the Associated Press state poll for the first time in school history. But as coaches will tell you, it’s not where you start – or in this case where you are mid-season – it’s where you finish. The Yellow Jackets got a lesson in that Tuesday night after avoiding the Northmont Thunderbolt’s upset bid. Sidney scored nine of the final 13 points to win 72-68, improving to 10-1 overall following the Greater Western Ohio Conference cross-over game. Northmont fell to 4-8. The win went to Sidney following a back-and-forth fourth quarter that featured a combined 30 free throws. Northmont led 66-65 with 1:32 on Prophet Johnson’s score. Sidney then took the lead for good, going up 70-66, on a pair of Andre Gordon free throws with 1:27 left and Lathan Jones’ basket and free throw with 48 seconds to play. The T-Bolts pulled to 70-68 with 28 seconds remaining. Gordon then capped the scoring with a reverse layup with 14 seconds left. Northmont’s final gasp ended with four misses, including three in the paint, to end the game. The ending was a sharp contrast to the start. Sidney sprint to a 10-0 lead, punctuated by a Ratez Roberts dunk. Northmont, though, hit the boards and outscored Sidney 16-2 the final 5:11 of the first quarter. Sidney never led in the second quarter – but did tie the game with two minutes left – and trailed 24-23 at halftime. The second half featured three ties and 13 lead changes, including eight in the fourth quarter. Sidney kept the ball in Gordon’s hands as much as possible in the fourth. Gordon, a 67-percent free-throw shooter, hit all six of his fourth-quarter attempts and was 12-for-12 overall. The Yellow Jackets finished 21-of-29 as a team. Gordon scored 20 of his game-high 22 points in the second half. Roberts added 12 points and Darren Taborn 10. Trey Werentz hit a pair of key 3-pointers. Keith Lee, who scored six points, came up with a huge defensive stop with 1:06 remaining. Sidney led 67-66 when Lee took a charge in the lane to force the Northmont turnover. Josiah Hudgins scored eight points and also stood out defensively, especially in the first half. The victory was Sidney’s ninth straight following a 63-44 loss to Mason on Dec. 1. Mason is ranked No. 8 in the D-I poll. Sidney twice reached No. 11 in the AP state poll with the 1995-96 and 1999-2000 teams. This year’s Yellow Jackets’ team is focused adding to its milestone season. 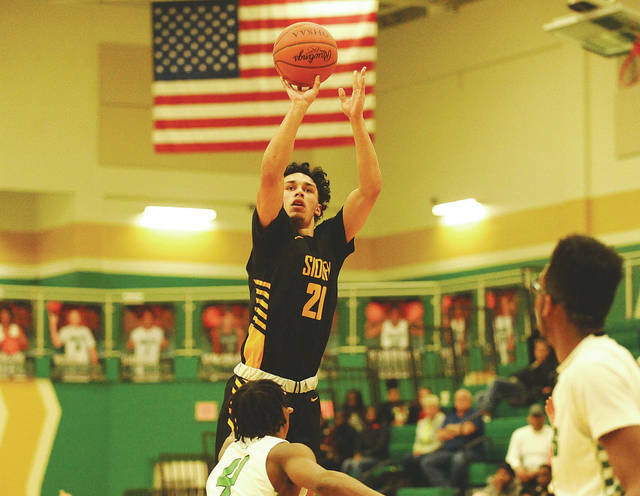 https://www.sidneydailynews.com/wp-content/uploads/sites/47/2019/01/web1_gordon1.jpgGreg Billing | For the Sidney Daily News Andre Gordon led Sidney with 22 points in the Yellow Jackets’ 72-68 victory over Northmont on Tuesday. https://www.sidneydailynews.com/wp-content/uploads/sites/47/2019/01/web1_ratez.jpgGreg Billing | For the Sidney Daily News Sidney’s Ratez Roberts (2) goes up strong as Northmont’s Jordan Smith defends. 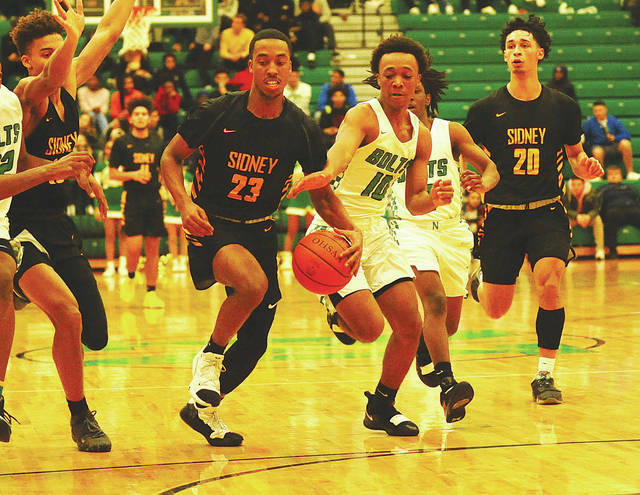 https://www.sidneydailynews.com/wp-content/uploads/sites/47/2019/01/web1_hudgins.jpgGreg Billing | For the Sidney Daily News Sidney’s Josiah Hudgins (23) leads Sidney’s fastbreak as Northmont’s Isaiah Baldwins gives pursuit. 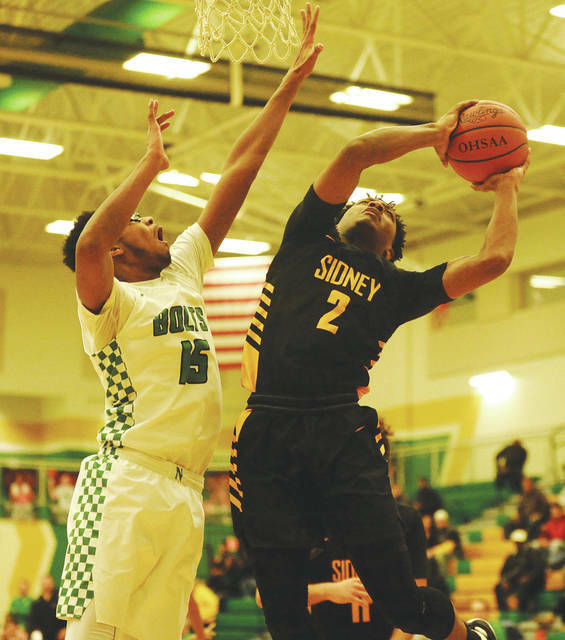 https://www.sidneydailynews.com/wp-content/uploads/sites/47/2019/01/web1_lathan.jpgGreg Billing | For the Sidney Daily News Sidney’s Lathan Jones (12) gave Sidney a 70-66 lead with 48 seconds left on his basket and ensuing free throw in the Yellow Jackets’ 72-68 win at Northmont on Tuesday. 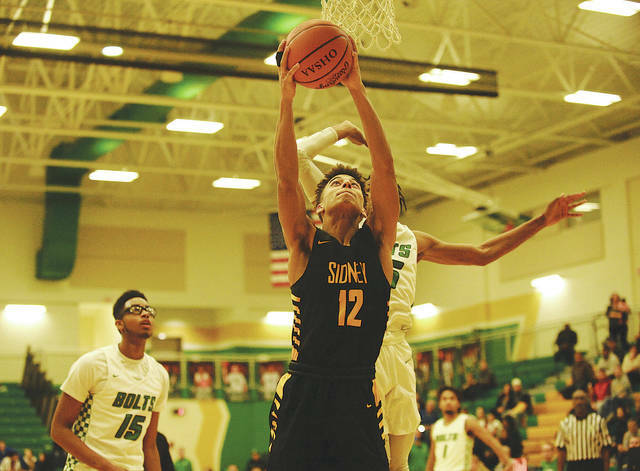 https://www.sidneydailynews.com/wp-content/uploads/sites/47/2019/01/web1_gordon2.jpgGreg Billing | For the Sidney Daily News Sidney’s Andre Gordon scored a game-high 22 points despite Northmont’s defensive focusing on the Virginia Tech recruit.